Andriy Parubiy, chairman of the Ukrainian parliament Verkhovna Rada, believes that interparliamentary exchanges can open up diverse channels of cooperation between countries. It is what translates the abstract language of diplomacy into real connections and frank understanding, spanning the whole spectrum of national industries and communities. In order to elevate bilateral political relations and explore new avenues of prosperity, he signed a memorandum of understanding in Seoul on Wednesday with National Assembly Speaker Moon Hee-Sang. 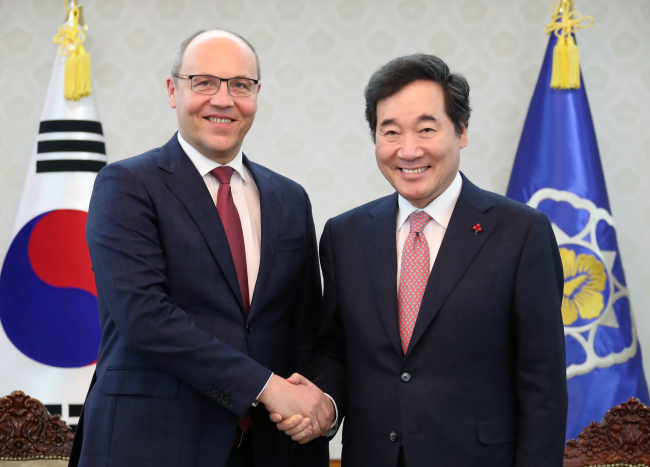 Parubiy came on his first official visit to Seoul and held meetings with Moon, Prime Minister Lee Nak-yon, corporate executives and members of the Ukrainian community here. He also laid a wreath at the National Cemetery for the April 19 Revolution in Seoul. Other industries ripe for foreign investments are information technology, logistics and transportation and aerospace and aviation, according to the politician. He added that the Ukrainian government has discussed the possibility of launching joint partnerships with Korean companies to manufacture train locomotives in Ukraine. Joint ventures for the production of agricultural machines also have ample potential, he added, noting they can be exported to Ukraine’s neighboring markets and the European Union. Parubiy stressed the current visa requirement placed upon Ukrainian citizens in entering Korea has hampered greater collaboration, while Koreans have been exempt from the requirement for visiting Ukraine. He assuaged fears, saying that removing the visa regime would not lead to Ukrainians illegally entering Korea, as EU countries, which do not have such visa restrictions on Ukrainians, have had no issues with his compatriots. During the meeting with Parubiy, Prime Minister Lee asked for Kiev’s support for ethnic Koreans who have lived there for decades following a forced relocation from Russia’s Far Eastern region in the late 1930s. Parubiy said Kiev and Seoul share historical similarities stemming from their geographic locations, including occupation by foreign forces. But both have managed to enroot democracy and a market economy, he lauded. This year also marked the centennial of Ukraine’s proclamation of independence on Jan. 22, 1918. The Ukrainian highlighted Kiev’s growing aspirations to be part of the European Union. Ukraine and the EU signed an association agreement in 2015, which entered into force last year. Parubiy added that Kiev has implemented these reforms while simultaneously countering Russia’s “hybrid aggression,” which he said ranges from political destabilization across the country and warfare in the east to military provocations and cyberattacks.